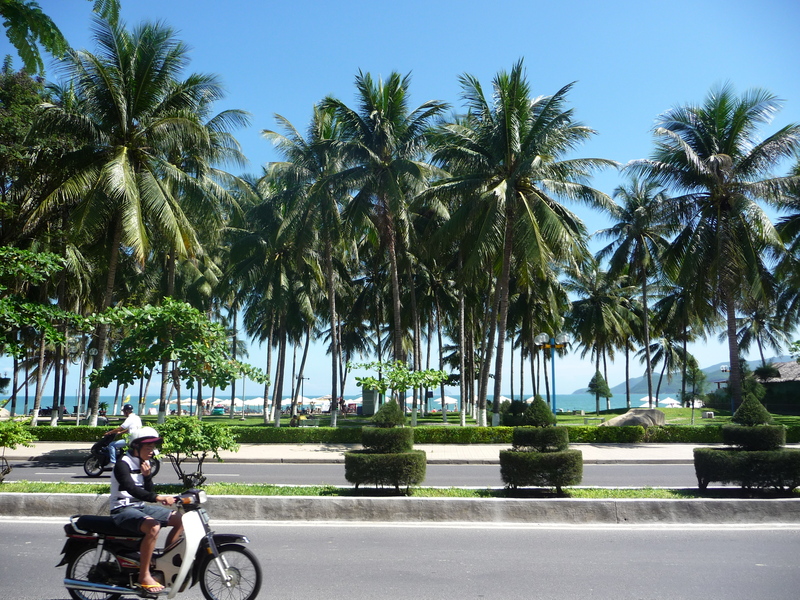 After spending much more money than anticipated due to the purchase of a suit and some other odds and ends we knew we’d better set our sights on the next location, Nha Trang. Now, talking to a few other backpackers we’d heard mixed reviews about this city. Some people thought it was a blast, had great nightlife, a fun amusement park, and a beautiful beach to soak in the sun. Others said that it’s basically what Florida is to North Americans for Russians. We decided though we’d likely not be in Vietnam for a little while so we might as well check it out and maybe even soak in the Russian cuisine and indulge in a Borscht. We had the option of taking the A1 for a straight shot south, or heading west into central Vietnam to again take the Ho Chi Minh Highway (HCMH). Either take a highway filled with traffic and construction, or drive the rolling, traffic-free countryside? It was an easy decision. We figured it would take about 2 full days of driving (8-10 hours per day) with a rest stop in Pleiku the first night – we couldn’t have been farther off. 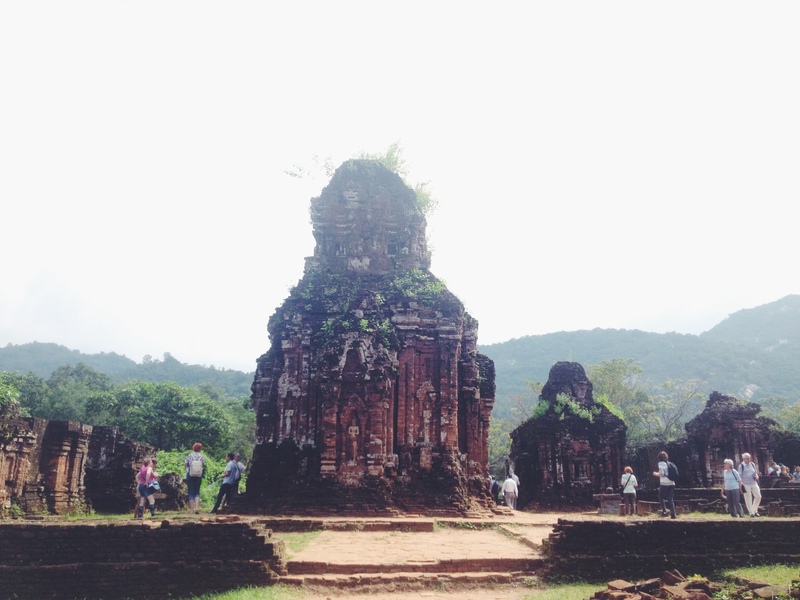 Leaving Hoi An we decided to stop at the ancient ruins and World Heritage Site of My Son. My Son is a collection of partially ruined Hindu temples constructed between the 4th and 14th century, and while its history is remarkable, the large crowds and tour groups really detract from the overall experience. We walked around for an hour, ate a quick snack and hopped on our bikes. 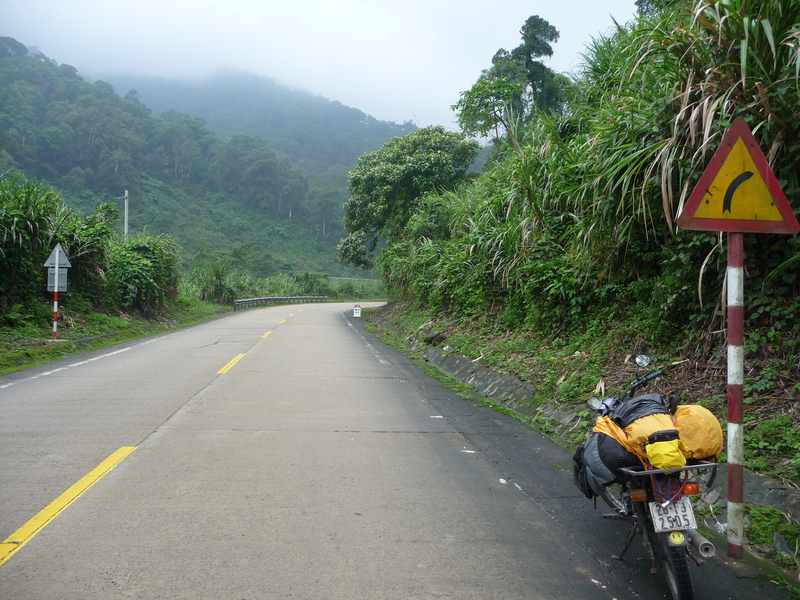 When biking through Vietnam, having some sort of GPS is paramount – usually. We plugged in the coordinates to Pleiku and Google Maps prompted 2 options: either backtrack 18km and hop on the HCM, or take a shortcut directly across, which Google Maps suggested. We’re the adventurous type so we decided to follow Google’s advice, it hadn’t steered us wrong yet. We turned onto the “shortcut” and found that the road was completely dirt and because of the heavy rains, it was just mud and puddles of water. The map said this road would be about 20km so we assumed this was just the front-end construction and we’d be on smooth asphalt soon enough. We were only able to go about 10km/hour, and we constantly had to walk the bike through deep mud pits as water soaked your bag on the back. After driving for about 20 minutes we realized that this road was not going to change for the 20km stretch and that it was too late to turn back! Our 20km shortcut ended up taking us about 2.5 hours! The bikes were caked in a thick layer of mud as were our shoes and anything else a metre from the ground. We finally found the grace of concrete after putting our bikes through the worst conditions yet and pulled over at the first restaurant we saw. It turned out that hardly ANY westerners ever take that road so we were quite the spectacle in this one-horse town, which led to a very comical lunch. After a much needed rest from the rough, muddy, and rocky road we still had 80km just to make it to the HCM highway, let alone the other 230km to Pleiku – our goal of a two day drive was quickly squashed. We knew we had to cover the lost kilometres from the day prior so we awoke with an early start and took to the tarmac. It was simply a day of driving. The morning looked like rain so we got all geared up for another stormy day. The man that ran our guesthouse from the night before promised us that in 20km there would be sunshine and that the rest of our drive south would be much the same, although we didn’t quite believe him (as it was raining pretty hard) we had a small glimmer of hope. Sure enough, after 20km the sun broke through the clouds and we cruised along the entire day to Pleiku. On route we also met Hans from Belgium and added a 5th to our bike crew. While the HCM highway is amazing and construction free north or Pleiku, south of Pleiku it’s difficult to travel more that 30km/h at any point until the turnoff for Dalat. 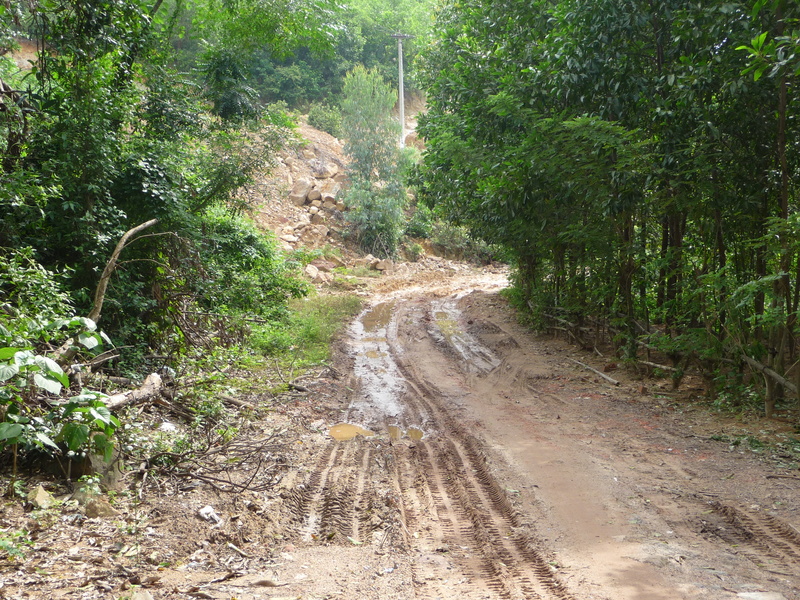 We’d heard of people trying adverse routes but we didn’t want another muddy road, so we stuck to the Ho Chi Minh. Although it’s full of construction, we made relatively decent time and in hindsight I think it’d be better to stick to this trail instead of taking a detour. 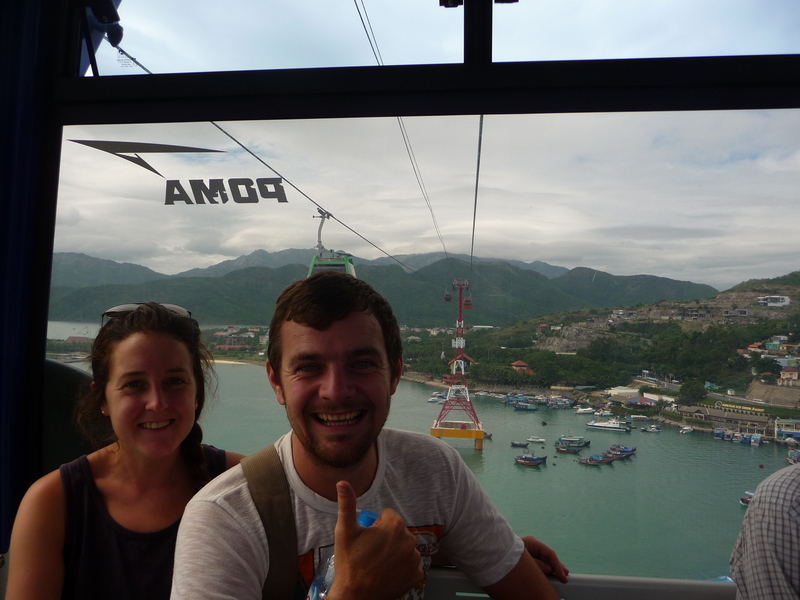 Before long we pulled onto the coastline and saw the restaurant signs advertising in Russian, and we knew we’d reached Nha Trang. What to say about Na Trang? Honestly, for one blurry night out on the town and a visit to the theme park it’s fun, but it could easily be skipped on any bike tour for a longer stay in Dalat. It’s a beach party town where restaurants are overpriced, tourists are scammed, and the city centre is crowded – but it does have a Vinpearl Land! 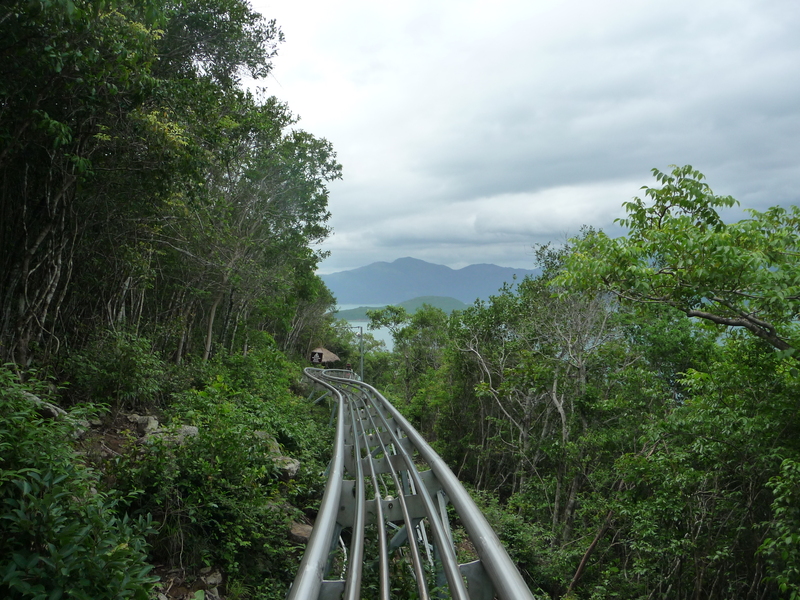 Visit Vinpearl Land – For a fun day visit this amusement park, which features the longest cable car over water in the world, a few fun rides (you control the brakes on one! ), a free arcade, some cool shows, and a water park! All the amenities are included in the ticket price that runs for about 400,000-500,000d ($20-$25) each. Have a night out! – Tons of bars and restaurants offer cheap drink specials and the Russians always know how to liven things up. Soak in the sun on the beach – Na Trang does have a beautiful white sand beach with beautiful blue water most of the year. From November – January the water gets a little murky. WATCH OUT. Our new friend Hans was pickpocketed walking home from the bar by an overly-friendly man – apparently this is common in Nha Trang, as it is in any tourist mecca. If not for the theme park Na Trang would have been just another night on the town, and wouldn’t be worth the stop. But we had fun and made the most of it, the next stop promised to be much more enjoyable.